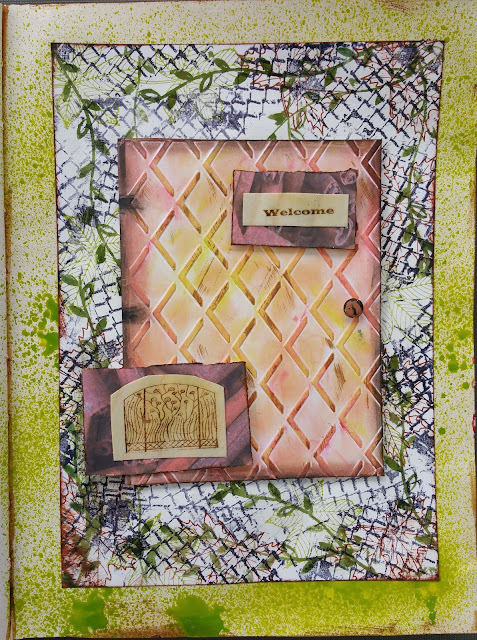 This piece has been created for the Paper Artsy Doors & Windows Challenge. Looking at their blog again today, I really wish I had put more time into this as some of the examples there are absolutely amazing. The pieces The two weeks of the challenges seems to whiz by and I often find I am thinking of ideas at the last minute. I especially like the Seth Apter post, door to My Imagination. The rustic colours and the interactive aspect are inspiring. 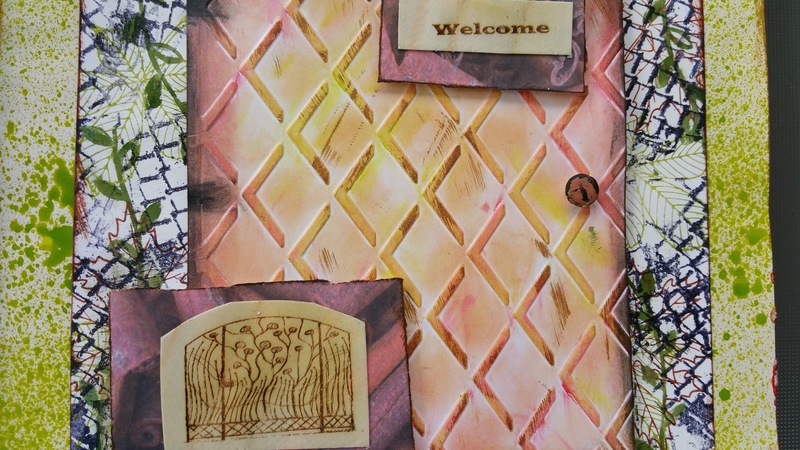 I had ideas about a door using a piece of card I had embossed and coloured with Gelatos some time ago, but never used. 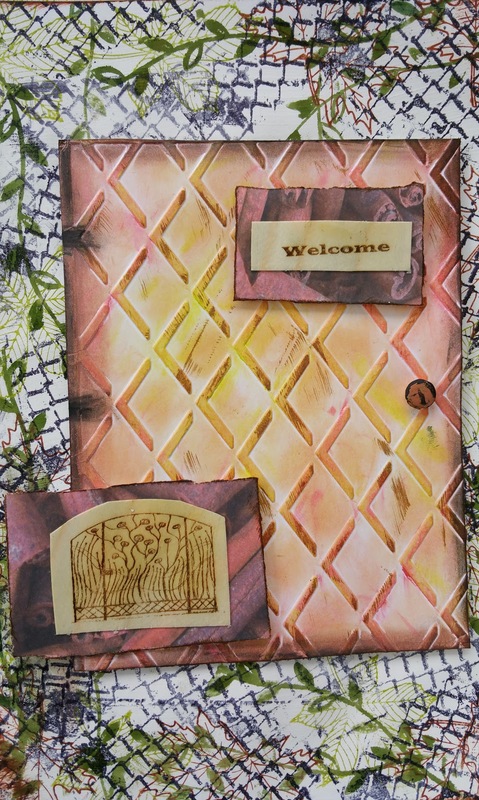 The lattice pattern reminded me of a gate so I added more colour, hinges and a split pin as a handle. I was going to mount it in my re-purposed journal so sprayed the paged with green acrylic. 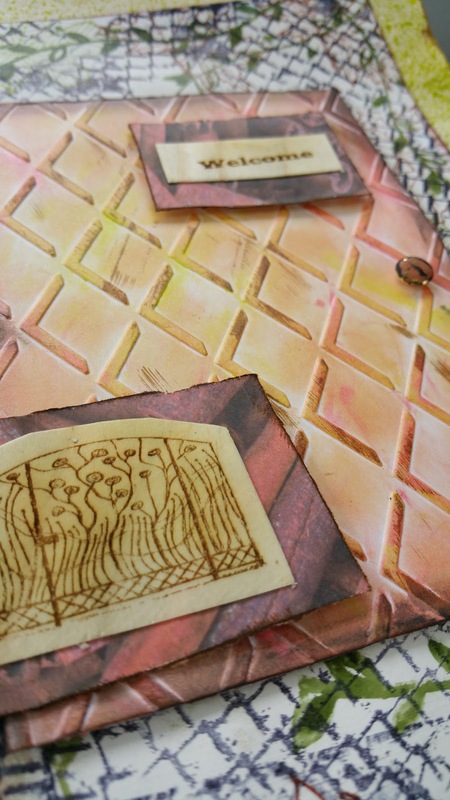 I then stamped another piece of card with different stamps and colours for another layer. It was all then mounted and the two small pieces added with mounting tape to give some dimension. The small gate and ´Welcome´ sentiment were laser engraved onto thin wood pieces. This piece is also entered in Simon Says Stamp Monday Challenge - Layer It Up.